Place millet in a saucepan. Add coriander and cumin. Pour in vegetable stock and bring to a boil. Next, reduce heat and let simmer for approx. 15 min. In the meantime, spread pine nuts in a dry frying pan and toast over medium-low heat until golden. Cut zucchini in half lengthwise. Scoop out the pulp with a spoon. Preheat oven to 180°C/350°F. Cut tofu into cubes. Roughly chop zucchini pulp and parsley. In a large bowl, add tofu, parsley, zucchini pulp, pine nuts, raisins, and millet. Mix well. Season with salt, pepper. 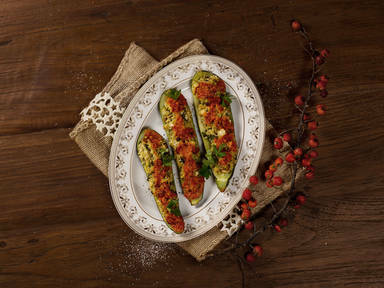 Place zucchinis on a lined baking sheet and stuff with millet filling. In a small bowl, combine soy cream and bell pepper cream. Season with cayenne pepper. Pour mixture over stuffed zucchinis and bake for approx. 10 min. at 180°C/350°F. Serve with cream mixture on the side.